After finishing the Tour Down Under and getting caught up with personal life, I have gotten back to painting. 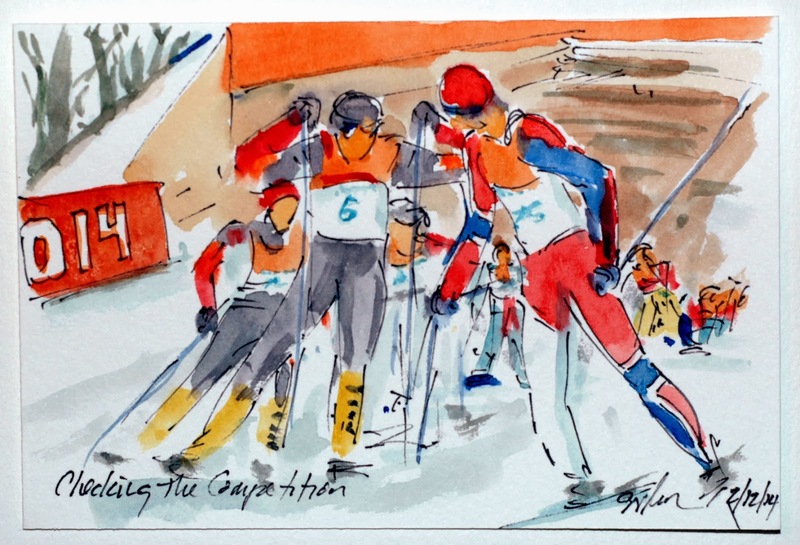 But instead of cycling I have turned my brush on the Winter Olympics in Sochi, Russia. I have worked hard to capture the spirit of the games and the beauty and grace of the athletes who are competing. In some cases the cross over is rather obvious, like this peloton of Nordic Combined skiers. Chance the mode of transport and this could be a cyclist checking his fellow breakaway companions before attacking. You can see all of my Olympic artwork at www.facebook.com/Greigsart (and yes, the work is for sale). On another note, here is an excellent article on my cycling art, and life as an artist/cyclist.